Digitalisation reduces the environmental impact of road transport and creates cost savings. 5G makes new kinds of smart solutions with trucks and warehouses possible – innovations are now being sought together with transport operators. “No more than three years ago, most transport companies did not think much of digitalisation. Now the situation is completely different, everyone has been surprised by how fast the change has happened,” says Satu Orava, an expert in the productisation of IoT at Telia. Telia has followed the change at close range; it has developed the IoT business together with the field of logistics. Currently, Telia is piloting the Fältcom product, which offers a brand-independent IoT ecosystem for the optimisation of heavy traffic. 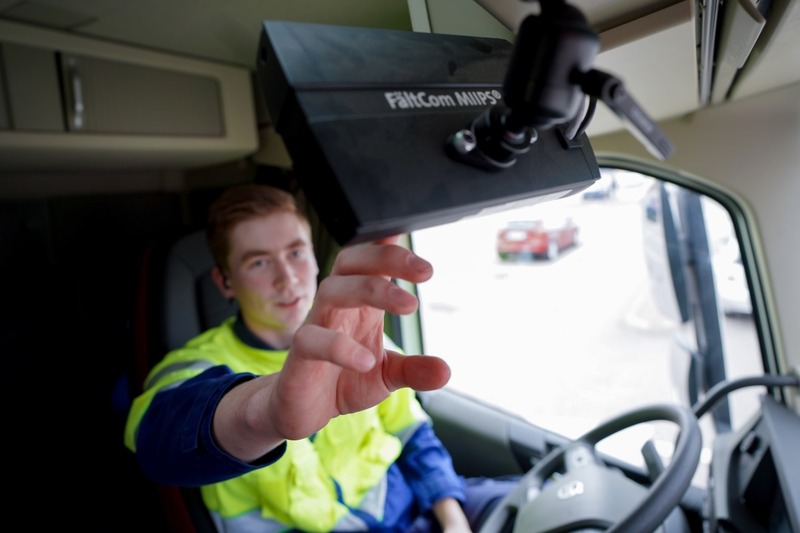 In trucks linked to the Fältcom solution, all drivers have a display in the cabin that allows them to receive driving instructions and monitor fuel consumption, among other things. “The monitoring has helped save as much as ten litres of fuel for every hundred kilometres, which means significant cost savings. This also reduces the environmental load,” says Kalle Mehtola, who is responsible for IoT sales at Telia. Nevertheless, the testing of autonomous trucks in limited conditions has already started. An autonomous electric truck by the Einride transport company using Telia’s 5G technology has started to operate in DB Schenker’s storage area in Jönköping, Sweden. The truck, called the T-pod, does not have a driver’s cabin, which means that it has more space for the load than an ordinary truck. The vehicle operates autonomously with the help of lidar, sensors and cameras, but it can also be controlled remotely, if necessary. Einride’s CEO Robert Falck envisages that in the future, up to 60 per cent of transport could be carried out by autonomous electric vehicles that are much more environmentally friendly than now. He considers 5G necessary for the safety of transport. The aim is to start the operation of the truck on public roads in the near future. What else does 5G mean in logistics besides self-driving trucks and better security of supply? “Among other things, 5G enables edge computing, or processing data near its application. In warehouses, edge computing means a faster reaction speed, a self-correcting process and information security,” Mehtola explains. In a nutshell, 5G brings the ability to process considerably larger amounts of data into logistics, too. “In Telia, we can centralise the data. We want to innovate all kinds of different ways of using the data with the customers,” Mehtola says. Do you want to be a forerunner in 5G? Join us in building the 5G innovations of tomorrow. With up to 20 times faster connections, you can take full advantage of the IoT and build services that require a fully reliable network.